MIAMI (CNS) — Pope Francis’ right-hand man on the environment and climate change issues urged Catholics attending a local academic conference to let Christian spirituality guide their thinking and actions toward preserving the full range of God’s creation. 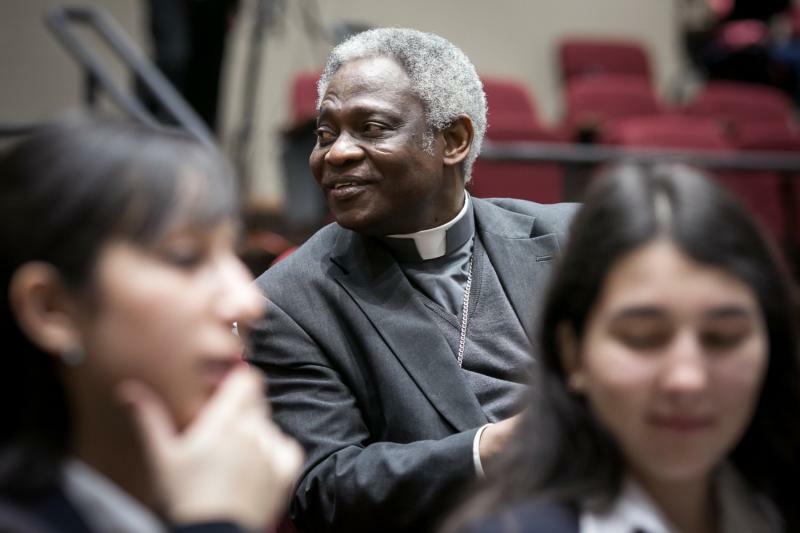 Cardinal Peter Turkson, president of the Pontifical Council for Justice and Peace, spoke Feb. 19 in Miami at St. Thomas University as part of the school’s two-day International Conference on Climate, Nature & Society. The event was spearheaded by the university’s Institute for Bioethics. In addition to being a scriptural scholar, Cardinal Turkson is credited with helping to draft “Laudato Si’,” the first papal encyclical in the 2,000-year history of the Catholic Church devoted solely to environmental and mankind’s collective responsibility to pass along a clean and safe planet to future generations. The document touches on such important areas related to human activity such as urban planning, overconsumption and human trafficking and they affect both humankind and the environment. Changes require shifts in thinking, the cardinal told the audience, which included students from several local Catholic high schools along with Miami Archbishop Thomas G. Wenski and several clergy and religious leaders of the Miami Archdiocese and of St. Thomas University. “Pope Francis asks us to consider what is happening to our common home, and he proposes an integral ecology that is natural but is also human and even social, and then bring this home to see what is happening in the United States and in Florida and what can be done by a university like St. Thomas University,” the cardinal said, noting the role of the church and Catholic academia. The cardinal touched on a list of fragile global communities and shorelines — including that of Miami Beach along with rainforest, desert and Pacific island communities — which scientists have identified as being under threat of environmental changes, rising sea levels and changes in precipitation. On the correlation between our own spiritualities and our treatment of the environment, Cardinal Turkson said our conscience is the “seat and home” of a conversion. “The care of our common home, as Pope Francis sees it, can never be achieved by individual initiatives or by the united efforts of men bred in an individualist way. It calls for a union of skills and unity of achievement of that can only grow from a quiet and different attitude,” he said. “Social problems must be addressed by community networks and not simply by the sum of good ideas, which means that for Pope Francis ecological conversation becomes community conversation undergirded by a very sound and profound spirituality,” Cardinal Turkson said. In a separate conversation with local media, Cardinal Turkson said the Vatican is welcoming a dialogue with U.S. industry and business leaders who are interested in furthering Pope Francis’ conversation and challenge to protect the environment, including U.S.-based solar companies. Plans are the works, he said, for a gathering at the Vatican in April for business and church leaders to discuss ecological issues. The conference organizer was Father Alfred Cioffi, a Miami archdiocesan priest, who holds the university’s Florida Blue endowed chair in bioethics and is director of St. Thomas’ Institute for Bioethics. He said he hopes the conference educates people, but more importantly, unleashes actions and ideas to curb global climate change. Pope Francis has time and time again demonstrated just how clueless and irresponsible he can be. His encyclical,’Laudato Si,’ demonstrates this clearly. It was written with the aid of five U.N. climate change radicals whose motives for the reduction of carbon dioxide include the reduction of people through contraception and abortion. The pope allowed no other opinions on climate to be heard even though they were offered. A pope who evades a question on homosexuality by stating, “Who am I to judge?,” who mocks people who have large families, who falsely states that the Church dwells too much on issues of abortion and homosexuality, and who most recently declared Donald Trump a non –Christian can’t be taken seriously. Pope Francis has abandoned the primary issues facing the Church to champion the very popular secular issues of climate change, immigration, and capital punishment. The Pope’s recklessness and ignorance will surely cause more death and suffering among the poor.